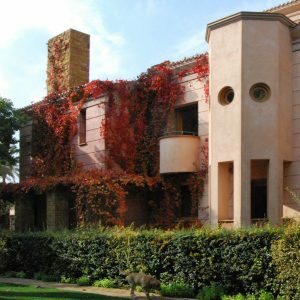 Residence ‘A’ in Kefalari, Kifisia, with private swimming pool, garden house and pool-house in a 5500m2 plot including another residence 1995-1997. A large, classical residence, conforming to contemporary demands for functionality and comfort, quite discretely fully air-conditioned and equipped with the most technologically advanced installations. The residence is designed with the required volumetric and morphological restrain to form an important contemporary link within a long-held tradition of classical stately homes, however with exceptional innovative and abstracted detailing throughout, all prototypical, custom-designed for the specific project. Very meticulous proportion consideration in volumes, facade elements and interior spaces, offer the essence of the classical ideal, transformed by innovative detailing for a more loose and casual life in contact with the extensive private garden in the mild Athenian climate. Also reflecting this ‘country life’ secluded vast garden atmosphere, the consistent throughout, carefully planned rustication of the exterior, uniquely designed in orderly alignment with the custom designed subdivisions of the window panes. This required a very precise control of geometry coupled with very precise control during supervision, the latter with the collaboration of architect A.S.Calligas. The bi-coloured exterior is not painted, instead the colour is embedded in the plaster, aging well with patina. Base and exterior terraces with soft and warm deep-coloured limestone, also aging well and most suitable for quick patina in the garden. Warm hues are dominant, tonally consistent with the surrounding greenery, with total exclusion of overly light or white elements and complemented with contrasting greyish (de-saturated) blue-green shades for shutters, wood elements and ironwork in pergolas and railings. The meticulously planned with respect to residence-geometry common garden of the two residences (belonging to close relatives), as well as interior finishes custom designed by the architect , are presented separately. 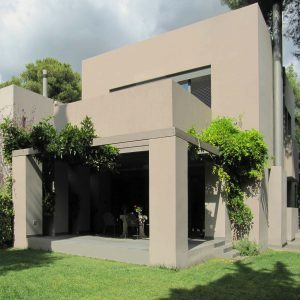 Residence ‘B’ in Kefalari, Kifisia. A stately c.1000m2 residence with private swimming pool and pool-house in a c.5500m2 family plot containing another residence. A mandatory volumetrically prominent residence due to extensive programme set by the clients in their preliminary meetings with architect A.S.Calligas, in relation with zoning restrictions of 350 max plot coverage per residence. Resulting design concept, an assembly of individual bi-coloured rusticated classical plastered volumes with consistent incorporation of the octagon-tower theme, all enveloped within the geometry of central interconnecting masonry elements. Fully and discretely air-conditioned, with advanced installations and amenities compatible with times of affluence and prototypical detailing unique for the project throughout. The bi-coloured plastered volumes were not painted, instead the colour was embedded in the plaster and subsequently partially stained with ‘restauro-lasur’ transparent colours thus aging with natural patina. Finishes include exterior terraces with warm coloured soft limestone most suitable for quick patina in the garden and interface with solid decorative brick construction in winding pathways. The warm hues are consistent with the surrounding greenery, including oak windows and shutters and contrasting greyish (de-saturated) blue-green shades in railings, garden ironwork and house metalwork finishes, as well as wood elements in house pergolas. Note the critical total exclusion of contrasting light tones or white. Despite precise control at supervision, last minute changes also affected the elevations and critical masonry elements. The design concept, was thus implemented as consistently as client confidence to the architects and respective contractor obedience allowed. Interiors by the architect and the meticulously planned and fully implemented common garden, are presented as separate projects. 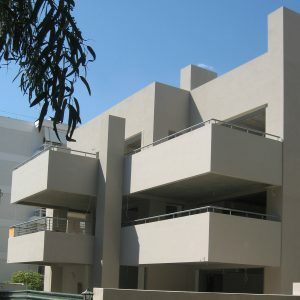 Attached-housing development project in a c.1300m2 plot in the exclusively residential up-scale Athenian suburb of Ekali (Koumarias Street), 2006-2008. The three two-storey residences of c.160-220m2 of main spaces plus basement for auxiliary uses and common parking, meet the precise programmatic requirements set by the developer, attached at first floor and basement level. Simple visual volumetric vocabulary that is repeated consistently throughout with precise dimensioning and detailing, offers an abstracted and harmoniously proportioned volumetric scheme, most modern in massing. Though it is abstracted with no superfluous, it is also profoundly classical respecting symmetry in major layout and single volumes-elements with careful consideration of proportions and avoidance anti-classical incompatibilities. Internal main spaces are clean and modern in detailing but all enriched with discrete classical symmetry and the hierarchical spatial prioritization the later implies. The harmonic proportions of each volume, elevation or internal space, with dynamic relations between horizontal and vertical elements carefully controlled, leads to an artistic expression of mass that combines classical abstracted simplicity with power of intensions. Tonally the scheme is intentionally very quiet, without tonal contrast – in tune with the mid-toned vegetation that abounds, while warm-cool contrasting hues are extremely de-saturated, blending with the natural environment. Cast-in-place concrete construction with plastered brickwork, convincing masonry veneer at places, stained hardwood floors with through-the-floor heating and high quality aluminium windows with fully retractable secure shutters. The largest residence features a circular stairway within symbolic ‘campanile-like’ tower in the centre of the complex, while in the one in the rear, the stairway lands centrally on the axis of the main garden window and aligned swimming pool. Unfortunately both the precise marble floor design at the open terraces/entryways and the naturally coloured (with local marble dust) plaster, were not implemented as prescribed due to budget constraints. The selected scheme, out of three quite opposite alternative approaches presented simultaneously to the clients- spreads the residence out as much as possible within the roughly triangular buildable area of the irregular plot. The most appropriate layout within the temperate Greek island environment, is consistent with the classical ‘Greek-House’ concept, arranged around a central protected open space. This results in a most private central open terraced area with pergolas and a central swimming pool in two layers featuring a continuously flowing waterfall between the two levels, directly visible from the main (summer) living room. The residence is designed with classical qualities and critical hierarchical arrangement of space around local axes in the elevations and overall layout of volumes, pathways, pergolas and pools, applying also to main interior spaces, all very precisely laid out down to furnishing details, including paving and exposed beam structure in the ceilings. Volumetric plan and detailing inspired from traditional construction but also re-invented details with a modern abstracted twist and careful proportioning of each volume or internal space, to an internally consistent artistic expression. The large main living room, with opposite views of both the pool-waterfall and the sea, was planned with prototypical retractable windows to fully integrate with the open. The main residence, featuring also classical formal dining below the vaulted master bedroom as well as the central pool area, were protected from the elements and prying eyes by covered pathways and semi-private spaces that led to the detached-private guest-houses. An introvert residence, compatible with privacy-requesting clients, inferior surrounding urban fabric, and local building codes mandating roof and low rise construction of only up to 7.5m. 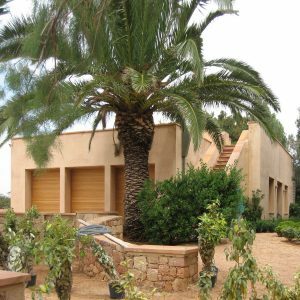 Thus, covered by a shallow, uniquely detailed roof, stressing the horizontal direction and creating a naturally shaded and ventilated environment, opening into the garden and merging elegantly and gradually the interior with the open-covered space protected from the hot sun, a quite unconventional approach for European-Mediterranean architecture, let alone local customs. Classical elegance and extreme flexibility by a combination of multiple small units to be combined into two completely independent residences with access from separate streets and impressive economy of space due to the limited buildable area, but mostly the requested ‘single residence’ appearance, was unusual. The very careful consideration of proportions, in volumes, elements, void to mass and precise geometry, in all external elements, that dress a residential complex of immense functional complexity in a regulated environment down to the most minute detail, offers a perspective of the challenges faced and the corresponding significance of the particular project. Legally a functional and flexible block of flats, with the appearance of a single residence. Minor discrepancies in chimney and fence completion and also in some interior finishes due to the economic crisis were experienced, hopefully temporal. 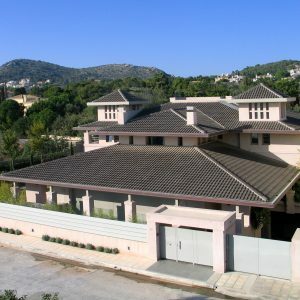 Sea-side residence in Saronis, Attica close to Athens in a c. 2.500m2 area, 2005-2009. 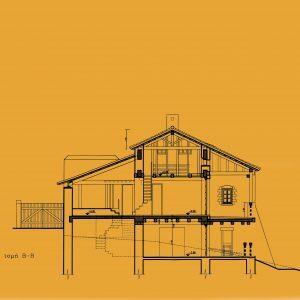 Design of a garden, innovative modern interiors, structural improvements and major elevation face-lift, on small 50 year old attached residence and a much older existing structure in disarray, located close to the sea. 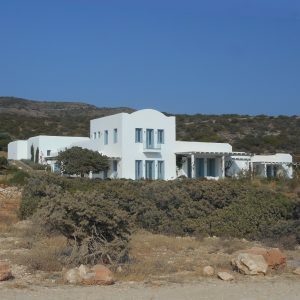 Functional and aesthetic unification and conversion into a consistent secluded refuge in a prime sea-front location with a c.150m sea-front shoreline. Overall a man-made small-scale sculpture around existing plantings, to cover dense demanding functional requirements in a unique location with unfavourable conditions: Landscape management aside, no building additions were allowed due to proximity to the sea while a large section of the enclosed area was no longer privately owned due to proximity to the main public road. Thankfully, old 80+ year old trees with massive trunks, most conveniently along the boundary of the area served as the best means to ensure privacy of the uniquely located open space, with pistachio, olive trees and varied ornamentals. Plaster coloured with natural materials, rough warm coloured masonry in paving and low fences, juxtaposition of rough natural and slick high-tech finishing materials for modern installations, elegant modern amenities and practically invisible air-conditioning system through innovative custom detailing on all interior finishes for all main spaces, modern detailing throughout, with custom designed prototypical oak sliding picture windows and safety roll-type oak shutters, bathrooms, open kitchens, elaborate false ceiling & lighting designs and paving inside and out characterize the small scale project. Garden geometry planned in direct relation to existing built volumes, small but functional spaces with symmetry and elegance, including roof pergola and roof planting, and an extensive garden pergola, designed to support existing old growth found on temporary support. The landscape design and the two interior projects, were commissioned by the owner separately over a period of three years and consistently implemented, with notable exception of the detailed paving design around the slightly transformed rudimentary poorly constructed swimming pool found on the site, where a fast track solution was devised and a deck was put in place instead. A three storey block of flats on a wide rather quiet street with plenty of greenery designed with a pergola on the roof and a private swimming pool for the ground-floor apartment. Storage, installations and play-room facilities at the basement connected to the ground floor apartment. The project manager being a close friend of the owner that introduced the designer team to the owners, exercised central tight control on the project and the construction process with economy and practicality as major concerns. Thus the entrance high garden pergola, offering also privacy from the neighbouring high rise blocks of flats was not implemented for reasons of economy, while various last minute changes affected several other spaces including critical volumetric issues such as the correctly placed false ceilings under the external balconies. Though modern volumetric composition, the three flats had been requested with relatively high ceilings and were accessed from a circular stairway. Additional internal stairway connects the ground floor with the basement level while the 2nd floor apartment enjoys private access to the roof (pergola and other installations of considerable flexible use). Quiet colouring scheme throughout and visual isolation from the street to the extent possible as requested by the owners. Functional common parking space at the lowest basement level. A New Block of Flats owned by a single family in Maroussi-(24, Paradeisou Street) Attica 2009-2016.Under Construction. A four storey block of flats on a triangular plot designed with a concrete pergola on the roof and three iron-and wood specially designed pergolas on the third floor. As the building was to be owned by a single family that previously inhabited the property, the precise programmatic requirements involved two small apartments on the first floor and single apartments on the 3rd, 2nd and ground floors. A auxiliary flat located on the first basement level was to be connected, to the ground floor apartment to form the residence of the owner. The second basement, extending to a large segment of the plot was to used for covered parking, according to Greek specifications. High quality construction, colour embedded in the plaster through the inclusion of natural coloured sand, traditional heavy-wet construction for a floor plan that allowed little room for subsequent changes as all rooms were guaranteed symmetrical, abstracted as much as possible. Wood high-quality doors and windows were possible in this project. The triple sliding window appearing as three separate windows from the exterior, an innovation of the architect, to ensure classical elegant proportions in openings, and a meticulously adheared to abstracted geometry throughout characterizes the project. The project was finished in full detail by the architect with the exception a a few smaller bathrooms where the client decided for tile finishing. An innovative lighting system from the ceiling was implemented though not with the full dimmer-capability desired by the architect, in order discretely stress architectural order within the tidily designed spaces. The architect’s colouring scheme was adhered to for the exterior of the building. 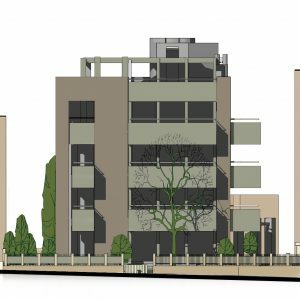 Prescribed initially as two residences of approximately equal size, it was later decided by the owners that the residence at the top should increase in size and importance becoming the main residence so the project was redesigned, at schematics phase. Building permit was issued after complete final study, still in time for the most favourable regulations allowing for 40% of (covered) ‘semi-outdoor’ spaces in addition to the permissible area of enclosed spaces. The project was eventually not implemented, due to change in the owner’s priorities. The main residence is laid out as a classical mansion with bold innovating-abstracted design-detailing, offering a wide view of the garden and built at a level suitable in order to visually isolate it completely from neighbouring buildings at a lower level, offering a 270 degree uninhibited distant view, including a hill with a dense natural Mediterranean macchia and pine tree forest towards the south-east. Both residences benefit from separate entrances & covered spaces for parking. The second residence with entrance at the western part at a lower level, is overlooking and in direct contact with a symmetrical completely private garden at the lowest tip of the steep triangular plot. 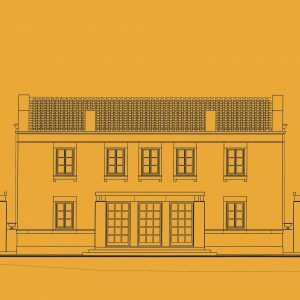 Absolute privacy and classical elevations for all residences characterize the composition, also determining the layout and architectural proposal. Special arrangements such as the elliptical grand stairway of the main residence and the layout of the master bedroom complex, all conformed with the specific requirements set in this project. The neighbouring building towards the east, belonged to a close relative. Kitchens, guest house and children’s bedrooms were oriented towards it. Traditional masonry residence at the boundary of the old village of Vytina, Arcadia in a 2.400m2 plot. Designed with the constraint of an existing foundation, implemented only partly due to change of circumstances. Discrete differentiation both in overall proportions of wings & windows and in minor construction details create the appearance of an estate constructed over several hundred years with multiple subsequent additions to the main central pre-revolutionary (i.e 18th century) styled –detailed, narrow orthogonal volume. Thus a design of a hierarchically ordered environment from the older most important ‘original’ core of the residence , to the additional terrace with masonry buttresses and western single-storey humble addition with a roof with a single slope, housing the hall and winter living room area as well as the additional wings of the entrance and secondary residence. Materials: Black (deep gray) local stone of Vytina built with visible connecting mortar coloured orange-brown. As the properly placed stones in a horizontal position, are all (besides corner-stones) irregular, the coloured binding mortar though actually dense in cement presents a wall with warm overall appearance. Hand-carved visible wood structure both in the exterior (chestnut wood), and in the interior (Pine & Cypress) Old hand crafted traditional roof tiles and old Maltese travertine floors. Simple rustic window shades, painted grey-green, and in the interior modern electromechanical installations – fixtures and slick modern finishes in contrast with the rough traditional masonry, natural crafted bearing wood and antique paving. A three-building complex in a sea-view 4.000 m2 irregular narrow plot. A historically loaded complex of three new buildings, consistent with ‘Ionian Island classical Venetian architecture” precedent. With hierarchical priority of the main two-storey residence as a pre-existing 18th century structure onto which more recent construction such as pergolas and one storey buildings were added. The project was also intended as an exclusive rental property. Two-storey main residence, auxiliary residence, pool, and minor third residence-storage facility in a remote location within the estate. All implemented in the 200 m2 area constraint of Greek legislature for plots of such area in the countryside. 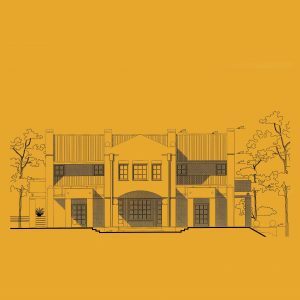 (Plus permissible covered garage space-storage space, basement etc) Schematic Design – Building Permit & Construction Documents, not consistently or fully implemented by local contractors-advisors hired by the owner. Classical elevations and interiors, dense functional program with modern amenities, and small scale imposed by existing legislation for new out- of town construction, determined the delicate scale and precise proportioning of this unique project. The layout of all buildings, pools, and pergolas in relation to each other, the view and in relation to the desired privacy and functionality of the whole estate, was the critical determining factor for the unique design. Innovative construction and detailing, ensured the authentic look of the whole with no trace of the mandatory in earthquake prone Cephalonia, rigid cast in place concrete construction. It is unfortunate that client confidence and over-reliance to local aids and contractors did not enable the precise control required for such a delicate project to be properly implemented in Cephallonia.